Are there Polar Bears in Russia? Russia is home to many polar bears and but the exact numbers are not known. According to a rough estimate there are more than 3,000 polar bears living in Chukchi Sea (Russian territory) alone. However the numbers can be challenged since the Russian authorities did not allow scientists to estimate polar bear population in Russia. The Russian polar bears occur in Barents Sea, Kara Sea, Laptev Sea, and Chukchi Sea. The Barents Sea population of polar bears doesn’t include Russian polar bears. 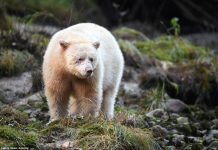 As a result scientists are pretty optimistic about the polar bear’s numbers and they believe that there may be thousands more than they initially anticipated. The Russian bears share their population with those living in Norway. 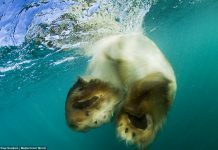 The survey of 2004 recognized the population size of 2,650 to 3,000 polar bears in the Barents Sea. The illegal hunting of Russian polar bears has been banned since 1956. Still many bears are found dead; many die of accidents while few are killed in self-defense. Each year the wildlife management in Russia also captures polar bears to raise them in captivity. However in Chukchi Sea polar bears are hunted illegally for the authorities cannot keep an eye on them. The Russian management appears to have less influence on those involved in hunting. Only the indigenous people are allowed to kill polar bears because their lives depend on it. Scientists are concerned with the Chukchi Sea population of polar bears in Russia because over the few past decades it has significantly triggered the illegal hunting throughout the country. It goes without saying that massive hunting has hit the conservation programs the worst. 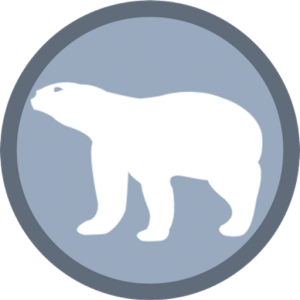 Read More: How Many Polar Bears are there in the World? 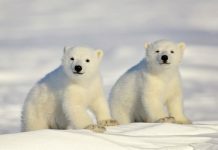 In the year 2000 Russia and the United States signed a bilateral agreement to save polar bear population in the Chukchi Sea. Under the Agreement on the Conservation and Management of the Alaska-Chukotka Polar Bear Population both countries are going to allow only the indigenous people to kill polar bears but the permission is limited by the number of bears to be hunted. That is not to say that local hunters will hunt bears at will. Read More: Are there Polar Bears in Russia? The purpose of agreement was to save polar bear population in the Chukchi Sea from endangerment. 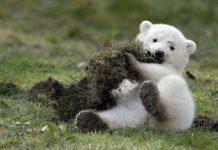 The overharvesting in polar bears is not going to be tolerated by either authority. The society representing the indigenous hunters in Russia is Chukotka Union of Marine Mammal Hunters and in U.S. the society is Alaska Nanuuq Commission. Both societies will make sure the terms of the agreement are to be followed effectively. In the year 2001 the Russian Federation issued the Red Data Book in which polar bears are given different statuses based on the specific population area. The book suggests the policies to protect the endangered and threatened species in Russia. 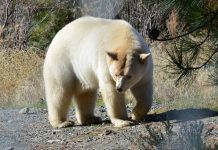 The Kara Sea and Barents Sea polar bear population is given the uncertain status whereas the western East-Siberian Sea and Laptev Sea population is listed as rare. The individuals living in the northern Bering Sea, Chukchi Sea, and East-Siberian Sea are thought to be restored not absolutely though. The Enviroment Protection and Ecological Safety in the Ministry of Natural Resources is the Russian body primarily responsible to implement these policies. Alongside Ministry the Regional Committees of Natural Resources is going to observe the population variations in Russian waters. 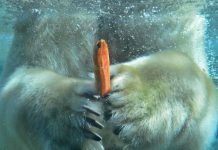 The Russian government set up the Natural Protected Area to make sure that the marine species including ice bears remain protected in the Russian Arctic. The Herald Islands and Wrangel Islands are home to numerous polar bear maternity dens and as a result this specific region is protected almost absolutely to conserve polar bears. 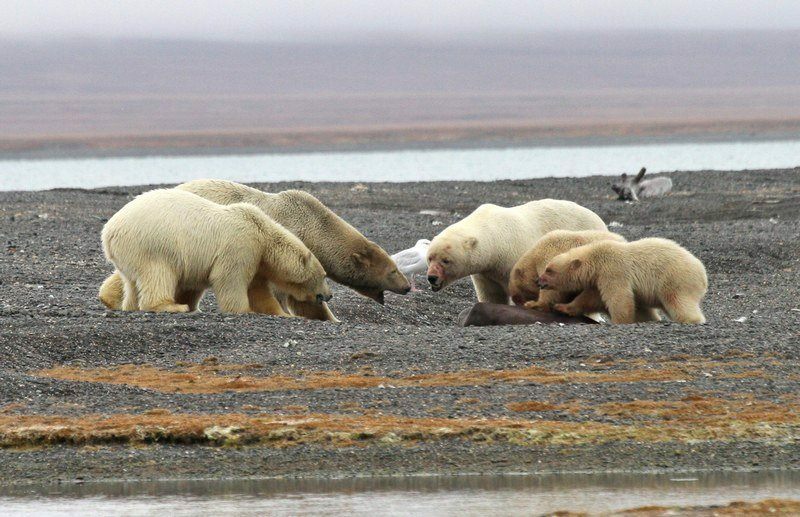 Furthermore the Novosibirsk Islands and Severnaya Zemlya have also earned special conservation status in relation to the number of resident polar bears.